"Investigators think they've identified almost all the people who may have contracted the potentially deadly hepatitis C virus at two Las Vegas outpatient medical clinics, a top public health official said Thursday. "In putting everything together, we've identified 114 cases in total linked to the two clinics," said Brian Labus, the Southern Nevada Health District's senior epidemiologist. "We still have some analysis to do," Labus said of the tally, which was up from 86 in July, "but we don't expect the numbers to change much." District officials say nine cases of the incurable blood-borne liver disease are the result of the unsafe practice of reusing syringes and medicine vials at the Endoscopy Center of Southern Nevada and the Desert Shadow Endoscopy Center. The other 105 people were diagnosed with the disease since becoming patients at the clinics, but could have contracted the disease in other ways, Labus said. Health officials say those identified with the disease are receiving treatment. Hepatitis C can cause swelling of the liver, stomach pain, fatigue and jaundice. Even when no symptoms occur, the virus can slowly damage the liver." Now that is a class action law suit about to occur. "... [We] learned some bank branches in the Denver metro area were evacuated on Monday after at least seven received letters that contained an unidentified white powder. "Initial tests show it's not harmful, but it is being sent to a lab for further analysis," said FBI Agent Kathy Wright. All of the banks that were sent the letters were Chase Bank branches. No one has been taken to the hospital according to Mary Jane Rogers, JP Morgan Chase spokesperson. She says some bank locations were evacuated, but did not have an exact number. The FBI has also confirmed it has responded to two Chase Bank locations in Denver, and one each in Centennial, Westminster, Lakewood and Arvada. The FBI says all banks were closed for decontamination as a precaution. The FBI says white powder was also found at a seventh bank, but did not immediately release the location. Two banks in Oklahoma City also recieved the letters and another in Norman, Okla. also got a letter. Denver Fire Department confirmed to 9NEWS that one of the affected banks is the Chase Bank located near Martin Luther King Blvd. and Colorado Blvd. Denver Fire says an employee at that branch found the powder when he opened a letter. In Westminster, an employee at the branch near 94th and Sheridan opened a letter just before 2 p.m. on Monday. The Westminster Fire Department says 17 people were held while a Hazmat team tested the powder. A test revealed it was harmless and they were released. The FBI took a sample of the substance. In Arvada, the fire department says the letter was sent to the branch at 80th and Kipling. They determined it was a type of calcium powder and was not hazardous. The West Metro Fire Department says they responded to a bank at Colorado Mills Mall. The Cunningham Fire Department says they responded to a bank at Smoky Hill and Buckley just after 1 p.m. The powder there was determined to be not hazardous and the crews left the scene by 4 p.m.
Lutheran Hospital says its emergency room went into lockdown temporarily on Monday afternoon after two people from one of the banks were taken there to get checked out. The lockdown was standard procedure and only lasted for about 35 minutes while the two people were decontaminated. Rogers says in addition to working with the FBI, JP Morgan Chase is also working with U.S. Postal Inspection Services. "We are working closely with (the FBI) to ensure the safety of our customers and our employees," she said. Rogers says she didn't believe authorities know who sent the powder. "We take these threats seriously," said Rogers. First reports of suspicious powder began coming in to authorities at 10 a.m. Monday. Sadly, these days, that kind of theory is all too plausible. "The results of tests conducted at the Special Pathogens Unit, National Institute for Communicable Diseases (NICD) of the National Health Laboratory Service in Johannesburg, and at the Special Pathogens and Infectious Disease Pathology branches of the Centers for Disease Control in Atlanta, USA, provide preliminary evidence that the causative agent of the disease which has resulted in the recent deaths of 3 people from Zambia and South Africa, is a virus from the Arenaviridae family." So what family of virus is this, you might ask? 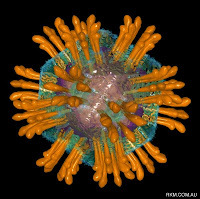 It is the family of viruses whose brethren and sistren are agents of hemorrhage, meningitis, hepatic necrosis, and liver failure. Sounds like a barrel of fun, that bunch! "..Analysis continues at the NICD and CDC in order to characterize this virus more fully.."
Sounds good to me chaps! This thing seems contagious and that is not good buddies. That means it is either airborne, waterborne, or bloodborne. If its airborne, of course, we could all be screwed... depending on its virulence. "Concerns are being raised about NHS performance on infection control in England - just weeks after ministers announced MRSA targets had been met. The Healthcare Commission's annual report on NHS performance showed a quarter of trusts were struggling to meet the hygiene code. The data also showed that just over half of hospitals had managed a sustained reduction in MRSA rates. It comes after ministers claimed they were winning the superbug fight. In September, Gordon Brown hailed the "tremendous achievement" in halving the national MRSA rate over the previous three years. But the watchdog adopts a slightly different approach to measuring performance. Instead of relying on national quarterly figures as the government does, the Healthcare Commission uses annual figures broken down on a trust-by-trust basis which officials said was a better demonstration of sustained improvement. These showed that only 52% of trusts had reduced MRSA by 60% - the figure was set higher than the national target in talks with ministers to ensure it was met across the board." The number manipulation is even worse in U.S. hospitals, BTW... Institutional fudging is endemic in most hospitals.